As a tent manufacturer, 60-year experience makes some differences. Our head office is located in Tao Yuan City Taiwan. A 20-minute drive from the CKS international airport and a 40-minute drive from downtown Taipei make you dropping by our head office easy and convenient. Our Taiwan office is responsible for customer services, order processing, R&D, material procurement, and small run sample production. What is worth mentioning is that many of the fabrics used in our productions are sourced from Taiwan. Taiwan is the largest source, next to Japan, of Asia’s highest quality lightweight synthetic fabrics. In addition, we have excellent local fabric processors for dyeing and coating for our fabrics. We also have fabrics from China, which are commonly used for price point tents or midrange tents. Chinese fabrics cost less than Taiwanese fabrics and it meets the generally required quality for midrange tents. So, you can choose the suitable fabrics depending on your needs. With our long running relationship with these vendors we can help you with almost any material needs you can think of. This website includes photos of our R&D department. Our customers are appreciative of our R&D department and deem it world-class given its facilities, scale, efficiency and capability. We are capable of producing any kind of prototypes, however complex or unique the product structures, with speed and accuracy. Satisfactory results only come from a complex process like this when you have professional pattern-making technicians, skilled sewers of this industry, advanced computer-aided pattern generating technology, and varied materials to choose from. Therefore, in most cases, we begin by working closely with customers after the formation of their concepts. We can then turn around perfect prototypes within a fairly short amount of time. That is the reason many of our customers are gradually doing away with their in-house R&D facilities and entrusting their R&D task to us. 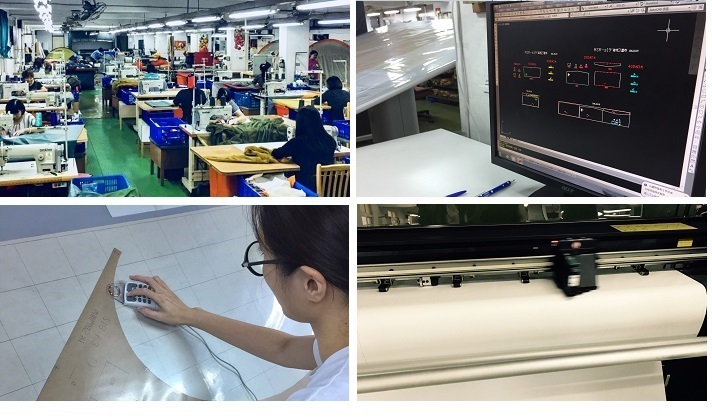 This kind of cooperation not only saves our customers R&D time and cost, which they would otherwise spend on their end but also ensures perfection and efficiency in product development. Your designs are safe with us. We keep customers’ designs strictly confidential as we respect every customer’s intellectual properties. That is an important reason that we can simultaneously keep long-term business relationships with so many brand names who are competitors to one another. Such R&D service is something no ordinary manufacturer can provide. To you, busy customers, this means fast sample production, saving time, and that any of your concepts or ideas (even your wildest dream) can be translated into reality! We are a sample builder and dream weaver for customers’ designers, a caretaker for product managers, and a source engine for material sourcing managers. We have two fully-owned production sites – one in the Fujian province of China, and the other in Hochiminh City of Vietnam. The annual combined capacity amounts to approximately 400,000 tents. The working environments in our factories are spacious, pleasant, well lit and tidy. Our factory buildings are made of concrete and steel. Note this distinct difference from the many temporarily built wooden or metal-sheet buildings which you can see quite often in Asia. We hope that by providing our employees with permanent and pleasant work surroundings we can increase productivity, escalate product quality and minimize the turnover of workers. After all, the attainment of high quality calls for skilled sewers and the experience accumulation calls for stable work force. The factory management is equally important in achieving this. In addition to our experience in managing productions, we have been fine-tuning production techniques and QA/QC systems, which our world-famous customers have exposed us to and trained us. There are quality checkpoints in stages of the production flow in an effort to ensure the products received by customers are flawless. While endeavoring to elevate production quality, we make sure to act as a responsible company that always keeps in mind employees’ welfares and employer’s social responsibilities. We have passed numerous factory assessments conducted by world-famous brands that we have business relationships with. We join them in upholding human rights, making sure our factories are running in an ethical manner and workers are provided with welfares in the aspects of human rights, workplace safety, wages, compensations, etc. Factory’s capability to prevent terrorism is also important. We take measure to prevent terrorism in accordance with C-TPET standards and we passed the C-TPET audit too. •Founded in 1997, Fully Owned. •Located in HCMC, 30 minutes drive from the HCMC International Airport. 10 minutes from downtown HCMC. •Right by the Saigon Ports. •Vietnam is one of the few countries in Asia that has abundant skilled and qualified sewers.